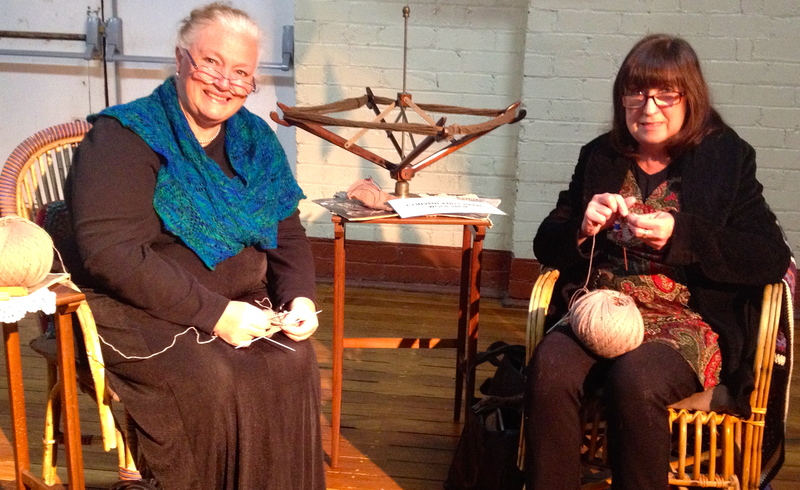 The locals were hardly surprised to see us knitting at the opening. One of our local historical groups, Rylstone & District Historical Society (who, by the way are also our landlords as they own the Bridge View Inn which houses our shop, Convent and Chapel Wool Shop), are holding a significant display at the Rylstone Memorial Hall this week. 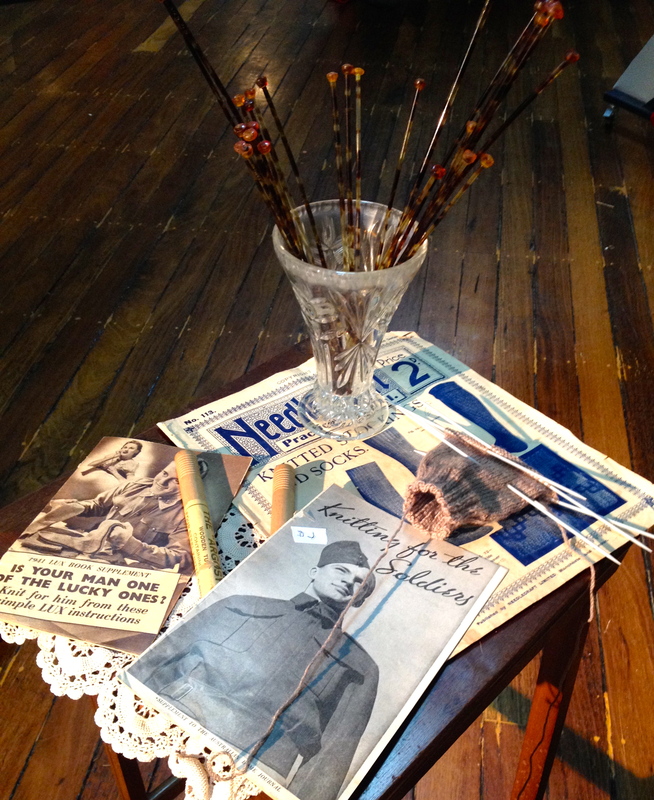 Some of our vintage knitting collectibles on display. ‘Stitches in Time’ focuses on the World War I quilt that was made by local residents as part of the war effort and is now housed in the Canberra War Memorial. Gemma and I were asked to participate by holding sock knitting demonstrations throughout the exhibition which lasts for a week. Tonight was the opening night and attracted a great crowd which seemed well-engaged. We’ll see how the week goes but look forward to meeting and chatting with visitors. 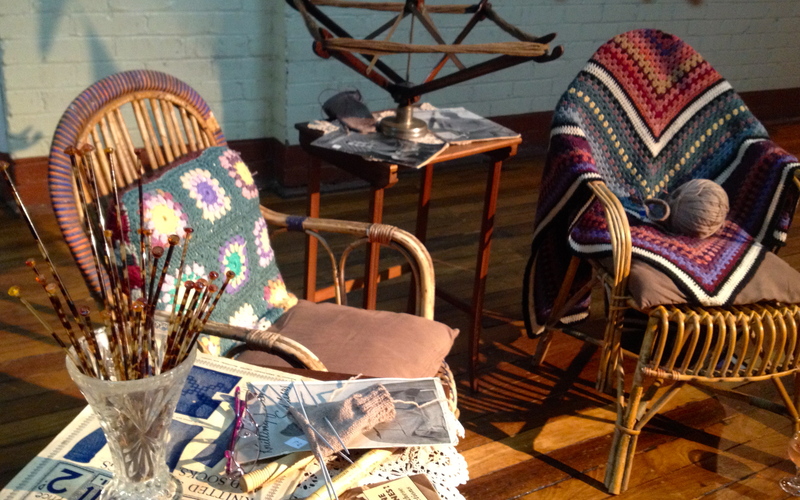 Our little area has been set up using our period cane chairs and some vintage crafting tools including my Edwardian swift, tortoise shell needles and vintage military war period knitting books that were offered to us, not to mention Gemma’s lovely crochet accessories. We have lots of sitting and knitting over the next week. I wonder how many socks we’ll get through!?! Our little corner display, sans the knitters doing the sock knitting demonstrations. Eileen, Many thanks. Gemma and I think we look VERY pretty!